1 - 23 $0.45 ea. 24 - 143 $0.40 ea. 144 - 287 $0.38 ea. 288 - 575 $0.36 ea. Designed with both high capacity and physical durability, Duracell Procell AA Alkaline Batteries are built for use in the harshest of work environments. 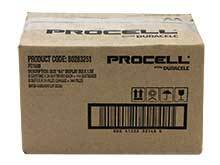 Procell AA batteries offer a sizable capacity that far outshines its competitors, as well as a lengthy 7 Year Shelf Life, thus allowing them to be stored around the office for when you need them most. These AA batteries are perfect for use with a wide range of commonly used work utilities, including flashlights, walkie-talkies, portable radios and various safety devices. These versatile cells feature a wide temperature operating range, able to perform perfectly at anywhere between -20°C to 54°C, so they're safe to use even in the most extreme work environments. When it comes to powering workplace devices, nothing beats a Procell! Please feel free to review our Packaging Guide to better understand how these batteries are sold. When purchased in quantities of 4, the batteries come in small boxes of 4 cells. When purchased in quantities of 24, the batteries come in a medium box containing 6 small boxes of 4 cells. We also sell the box of 24, if preferred. When purchased in quantities of 144, the batteries come in a large box containing 6 medium boxes. We also sell the box of 144, if preferred. So far I've been very happy with these. The price was good, and the quality was the great Duracell product. I have been using these in the common battery draining devices that we use every day, and they've held up well to the Duracell tradition. Good product at an excellent price. Other than 3 years less shelf life, I am uncertain why these batteries are cheaper than their Coppertop counterpart. My go to AA value! I run a bike shop and we sell lights that often come without batteries or with batteries of questionable origin. We buy these in quantity and resell them for about the same price as local pharmacies and grocery stores. My customers like the convenience. We also use them in the shop for mission critical equipment. ProsGreat price. Good battery life. Consistent excellent quality and freshness. What is the amp/hour rating on this battery? The capacity of the Procell AA batteries is 2900mAh.